I'm awful at sports. I have been for as long as I can remember. The thought of a "friendly" game of anything - softball, kickball, frisbee - can send me into a middle school angst I don't enjoy reliving. In my younger years, that was hard. I felt deficient. But now it's just a part of me - something I can laugh about and honor. I love cheering people on from the sidelines. I'm excellent at shouting, "Woo-hoo! Keep it up guys!!" I've accepted that rowdy games of touch football are not in my future. But there are these other things - things that I'm supposed to be good at, that the Me that I imagine myself to be is good at. But, the thing is, I'm not actually good at them. My wife gives me this particular look every time I come home with a plan for a home improvement project. Her eyes plead with me, Are you sure you want to do this? And my response every time is one of two things: dismissal or anger. No matter how many times I have sat cursing or crying on the floor surrounded by a pile of screws and power tools, I refuse to believe that when it comes to carpentry projects, I'm just not that good at it. My picture of myself is as someone who is crafty and resourceful, who grew up with crafty and resourceful parents, who learned a little something from them, and who can drive a flipping screw into the wall without stripping it. Every time. Every. single. time. I strip a screw (or twelve). The anchors won't go in. I misjudge where the stud is (even though I'm using a stud finder). The shelf is crooked. The curtain rod is wiggly on one side. I ruin the board. The project that was supposed to take fifteen minutes is still unfinished two days later because I had to walk away after an hour and a half of struggling so I didn't throw my drill across the room. The problem is not that all of these things happen. It's that every time, I refuse to accept that they're going to happen. 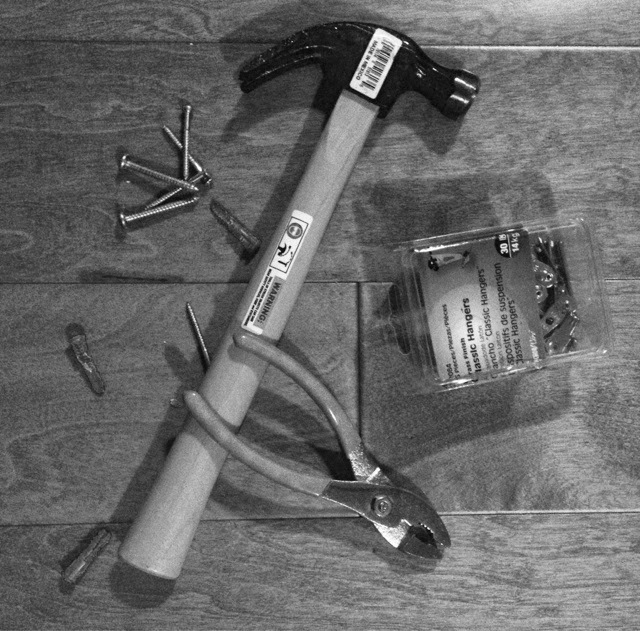 Each time I pick up a screw or a hammer, I think this is the time that my natural handy abilities are going to kick in. This is the time that the fifteen minute project is going to take fifteen minutes. And each time, I battle against the realization that my perception of myself is flawed - at least in this regard. So while it's frustrating to strip a screw or ruin a piece of wood, the real temper tantrum is about something more - it's about who I think I am and who I am repeatedly forced to realize I am not. I'm not saying that I can't do carpentry projects, that I can't learn how to hang my own shelves and put up curtains. But I am saying that I am finally beginning to realize that I do have to ask for help. I do have to expect that the project will take me ten times longer than it's "supposed" to. I do have to plan to mess up. Because while I want to be someone who is self-sufficient and can just pick up a hammer or a screwdriver and take care of anything in my house, I'm not that person. At least not yet. I'm just not that good at it. But I'm also beginning to realize that's okay. Because once you accept that you're just not that good at it, that's when you can be honest about how to get good at it. That's when you can stop battling and start learning. So, help me out here and fess up. Are there things you think you're supposed to be good at, but you're just not? p.s. I have completed one awesome carpentry project!